Made From 100% long-Staple Cotton-Soft, silky,Stronger,More lustrous finish&Eco-friendly.And it does not fluff or kink and have double mercerising which gives it its beautiful pearlised sheen- Suit for any projects!!! 138 skeins of variable rainbow color floss.Each color Per 1 skein , Each skein is 8 m long and includes 6 strands. Adorable Bright Color Variety - you get approx. 138 different colors/approx. 1 skeins per color- vibrant and engaging rainbow colors. For friendship bracelets;hand embroidery;cross stitch work;arts crafts projects;floss decorations;floss cross stitched postcards，suited for all embroidery lovers even beginners. 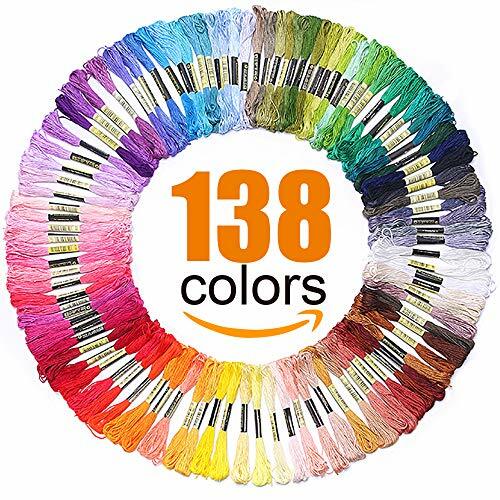 【Vibrant Floss ColorS 138】skeins Floss,vibrant and engaging rainbow colors , contains all the colors, blue, green, red, orange, pink, yellow, gray, black, white, etc., to meet your need for colors-For thread color numbers. 【SPEC】Each Floss is about 8.75 yard long and each skein of embroidery floss comes in 6 ply- long and strong; You can split the floss in accordance with your needs. Each Floss has a regular packing style, you don't have to rip out the wrapping paper, find the line head, pull it straight out, because the line can come out in sequence. 【Multi-Purpose Floss】For friendship bracelets;hand embroidery;cross stitch work;arts crafts projects;floss decorations;floss cross stitched postcards，suited for all embroidery lovers even beginners，And this 100%cotton thread string also great for tassels, childrens crafts, string art, diy projects for kids and punch embroidery. 【1-Year GUARANTEE】Excellent High Quality Floss, Amazing Value for Money√ Secure Checkout√ 7x24hours Customer service √ 100% hassle-free satisfaction guarantee√ - rest assured we won't let you down. Perfect for kids, beginners and DIY lovers - makes an ideal gift! 【Made From 100% Mercerized Healthy Cotton 】138 skeinsSix-strand colorfast, non-divisible, fray resistant, and 100% mercerized cotton floss.Raw materials of 100% long-Staple Cotton is soft, silky,Stronger,More lustrous finish&Eco-friendly,not fluff or kink and it have double mercerising which gives it its beautiful pearlised sheen.Floss are spun from Natural cotton,Excellent degradation capacity&Non-synthetic chemical materials are good for people's health,so called " healthy cotton" is ok. If you have any questions about this product by LOVIMAG, contact us by completing and submitting the form below. If you are looking for a specif part number, please include it with your message.